Our studio has been located at this location in Berlin – Neu Westend for over 30 years now. A small shop setting, the atmosphere we provide is pleasantly timeless, warm and welcoming. Experience a pleasant and personal atmosphere in which we will take plenty of time to be of service to you. 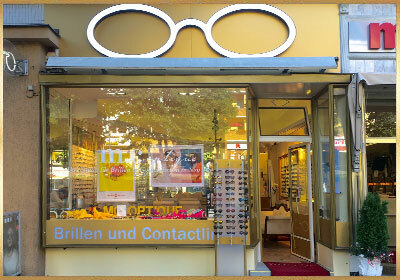 We will be happy to discuss your personal style and develop individualised solutions for progressive power lens glasses, multifocal contact lenses, eye sportswear and much, much more. In fact, we can even custom-make sophisticated eyeglasses in our own precision workshop. The right lenses … for ideal vision. To determine which lenses are right for you, we will first discuss your personal vision needs and the particular activities for which you require vision aids. The aim of our various testing procedures will be to determine the lenses for both eyes that will give you optimal, strain-free vision. With modern equipment at our disposal, we will precision-test your vision and prescribe the perfect contact lenses for your needs. We recommend that you test them for a number of days to ensure a good fit and help you become accustomed to your new visual acuity. 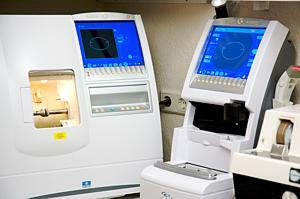 Exceptional visual acuity and comfort is what m.c optique aims for using high-tech computer-aided testing apparatus: the Zeiss Video Infral System. This system enables us to achieve a new dimension in prescription precision for your individualised progressive power lenses. Our in-house master workshop combines state-of-the-art technology with precision craftsmanship. We guarantee that all our products are of the highest possible standard and quality. 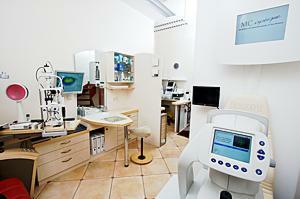 Our specialty are rimless spectacles. We will be happy to fashion a customised model or make repairs to the one you have. While it is essential that your lenses provide the best-possible visual support, it is also important to ensure wearer comfort for your spectacles. 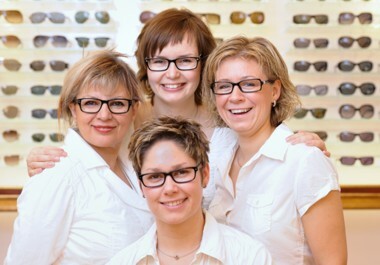 We therefore recommend that you come in for regular frame fittings and lens cleansing. And we will be happy to keep regular checks on your vision while you wait. We have made it our mission to provide ideal customer satisfaction.